Helle knives are one of those products that’s going to last decades and maybe even be a cherished item that you can pass down to your future campers. At Algonquin Outfitters many of the products that end up in our stores come from personal experience and a proven track record as true quality gear. Joining the ranks of other great brands like: Arcteryx, Marmot, Olukai, Patagonia, The North Face, and Weterlings and Hultafors axes, to name a few. Helle Fabrikker was established in the early 1930’s in response to hard times and the depression. The unemployed brothers Steinar and Sigmund Helle started making farming tools and other implements in the forge of their father’s farm. In 1932 they started making small sheath-knives which quickly became popular locally. Thus, the foundations of an important business in a typically Western-Norwegian rural area were laid. As production increased they were forced to go further afield to sell their products. The first big sales journey was by bicycle to Oslo where knives were sold at 40 øre each. Only sheath knives were produced for the first 15 years, but in 1948 production of table knives started, closely followed by forks and spoons. For the next 25 years, cutlery became the main product, but since the mid 1970’s, sports knives and forged knives for silver cutlery have accounted for most of the production base. As there was no electricity in the village, the whetstones had to be spun manually during the initial period. When electricity arrived towards the end of the 1940’s it became possible to move production to larger and more suited premises. This did not mean that production became automated, however. Our knives are made to withstand the strains they are subjected to in the Norwegian outdoor environment. That is why we use triple laminated stainless steel in our blades. This results in an almost unbreakable blade which stays sharp for much longer. The steel we use is more expensive than in most other knife brands, but that is all a part of Helle’s philosophy of no compromise on quality. Or what about the first time you gutted a fish you had caught yourself? For a Norwegian, it is most likely that he or she would have used a Helle knife. Whereas many knife manufacturers today depend on automated production and large product lines, we depend on quality and production through craftsmanship. Since 1932, Helle knives represented the very highest traditions of quality in Norwegian craftsmanship. 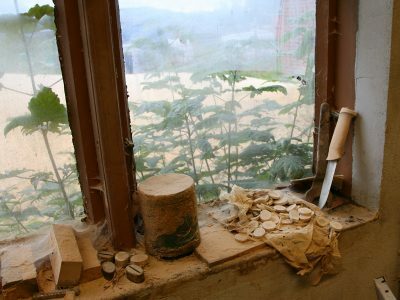 Despite its aesthetic qualities, a Helle knife is not made to be an ornament. It is made to be used. Follow Helle on Facebook here. Co-designed with Canadian wilderness photographer Laura Bombier, The Helle Algonquin is a small, nimble neck knife named after Algonquin Park in Ontario, Canada. Handmade in Norway using darkened oak, curly birch and red leather inserts, the handle shape features a slight pommel at the end, as well as a small finger guard and thumb notch for maximum dexterity and superior handling. The 69 mm blade is made with Helle’s triple laminated stainless steel for unparalleled strength, sharpness and corrosion protection. Watch the video here. Handcrafted using traditional methods that have been passed down for generations, the Arv Knife is worthy of inheritance. A versatile lifelong companion, the Arv dispatches cutting tasks with ease. Featuring a drop point blade made of Helle’s renowned triple laminated stainless steel with a razor sharp Scandinavian grind and natural materials curly birch wood, antler and leather. The deeply contoured wooden handle provides positive control for detailed projects like carving. 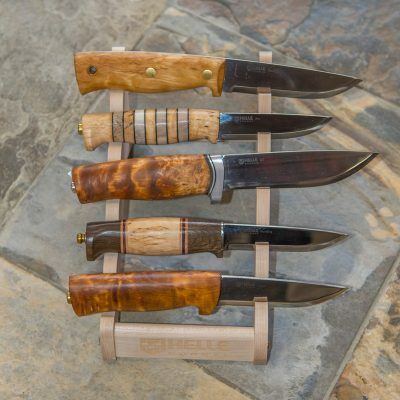 Each knife comes with a Nordic style sheath made of rich tanned leather. Designed in collaboration with Les Stroud (aka Survivorman), the Temagami epitomizes decades of knife making craftsmanship and an extensive knowledge of the great outdoors. Like all Helle knives, the Temagami comes backed by a lifetime warranty. The semi-full tang provides the extra strength associated with bushcraft knives. The tang is exposed on the top and pommel end, but is covered by the wood of the handle on the finger side. This protects the fingers from direct contact with the steel in cold weather. The drop point style blade is made of triple laminated stainless steel that provides excellent edge holding toughness and ease for sharpening. The handle has a bit of a finger guard to help keep your hand off the edge when slippery. The handle shape on the updated version of the Temagami allows a better control of the knife when holding in more positions. The Temagami comes with a Scandinavian style pouch sheath retaining the knife securely without the need for snaps or straps. View the entire Helle 2017 Catalog online at this link. While in Norway, Les paid a visit to Helle, located on top of a viking burial ground in the rural village of Holmedal. Check out the video to learn more about Les’s visit along with the skilled craftsmanship that goes into making all of Helle’s prized knives. TOP SELLER. Co-designed with Canadian wilderness photographer Laura Bombier, The Helle Algonquin is a small, nimble neck knife named after Algonquin Park in Ontario, Canada. Darkened oak, curly birch and leather handle is perfect for small and medium hands. Features Helle’s triple laminated steel blade for general purpose outdoor use. Lifetime Warranty. A Helle knife is made to withstand the stresses and strains that a knife is subjected to outdoors. Helle upholds its traditions of craftsmanship and quality rather than large product lines and automated production. We believe that quality is best preserved through skillful craftsmanship. Where are they made today ? Hi there, do you ship to Australia? Peter thanks for the comment / question here. I did a little more digging and there’s a distributor right in Australia that you can contact for local retailers in Australia, hope this helps you easily track one down new your home.